Here’s another Pokemon Go post, but this one is designed for the historical purpose of documenting the moment. You see Pokemon Go is so big right now that it astounds me how much it’s effected our culture and lifestyle. As I previously wrote, I’ve been walking like crazy. But I want to take a minute to just document the early days of Pokemon Go so that when my children ask “What was it like” I can give them a solid answer. I believe that it’s impact is so revolutionary that people will be comparing it to Beatlemania in the upcoming years. It began with a mild curiosity. My daughter was smitten with the Pikachu character because it was cute and yellow and cute. So for Christmas I bought her– and yes I mean her– a copy of Pokemon yellow for the Gameboy. I was hoping that it would encourage her to read and that we could play the game together and bond. We started to play it together but she started to lose interest. I think partly because I was controlling the game and secondly because she would have to listen to the games repetitive text. But I became hooked and we played the game for many weeks. While my interest in the game waned Ava was still smitten with the Pikachu character. So much so that she was in absolute hysterics when she saw her first genuine Pikachu stuffed animal in the wild. Now at our home we’ve absolutely banned the procurement of new stuffies because they spread like wild Tribbles. But I saw her desire and I saw her defeat when I firmly said no. She was crestfallen and hung her head and drug her feet. I wasn’t going to let her win by begging. That’s bad parenting. But I realized here I was buying games for the old Nintendo and she was going to walk out of the store with absolutely nothing. That hardly seemed fair. 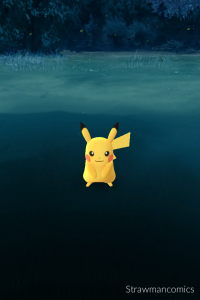 So with some sneaky maneuvers I grabbed the Pikachu without her knowledge. When she realize that it was now hers she was overjoyed. In hindsight it’s been one of the best toy purchases for my daughter. She will often be excited about getting a new thing but rarely values it. So in this case she has treasured her Pikachu and will often take with her on our Pokeadventures. For summer vacation she visited my folks for a few weeks and we missed her dearly. So as a “I missed you” gift I bought some Pokemon trading cards so that we could bond over playing the game. I thought it would be a little less complex than the video game and she could take more ownership of it. But as I quickly discovered the game was way too advanced for her age. Then a week later, lightning struck. Facebook was swarming with posts about this new app called “Pokemon Go”. I was mildly interested because of the aforementioned encounters with the property. My neighbor expressed his lament that his phone wasn’t capable of playing the new game and I wanted to see if any my phones would could handle the app. I tried my old android phone but it was no where near compatible. On a whim I tried my 4s iphone. Not so I could play but so I could see what the app was all about. To my surprise I found the app on the itunes store and it worked. Kind of. And that’s what I’ll remember for the first two weeks of Pokemon Go. The white Niantic logo followed by and endless blue progress bar that seemed to never make progress. But when the app did work it was like magic. Something inside of me changed when I caught my first Pokemon. I was so excited! I caught my first Pidgey. Now when I look jadedly upon my current Pokemon collecting, Pidgeys seem like a trifling nuisance. I knew nothing about Pokestops or Gyms despite the short paragraph from Prof. Willow. 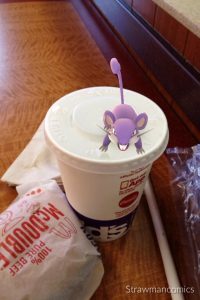 I was at McDonalds and I had a Rattata spawn happen inside the restaurant. I was jubilant. After I finished my poorman’s special at McD’s. I tried to visit a Gym. Nope too far away. 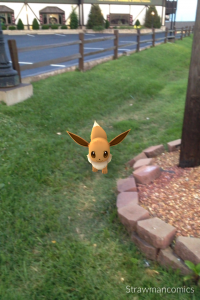 Walking about, I encountered a wild Eevee. Yes! I wanted to document this occasion. But alas I then experienced what would be my first real Pokemon disappointment. My first tarnished experience. I captured the Pokemon on the camera but not for my Pokedex. The app crashed and I was left with a jaded memory. I wasn’t quite hooked yet. That happened when I was at a park and I saw all these Pokestops around me. I just got out of a serious business meeting and I decided that I had time to do the Pokemon thing. I was still embarrassed about flirting with this trend. I didn’t want to be seen doing it but people knew exactly what I was doing. And so do I. I could see them. I could see the Pokemanaics everywhere I went. I could see the community. I could feel the acceptance. I could feel the comradely. I was still in the park and I encountered a Meowth. I was super excited to catch him but my poor phone just couldn’t handle the buggy app. By the time I was able to log back into the app he was long gone. But a curious thing happened. I heard a voice from an adjacent car say “Playing Pokemon?” and I replied with “Yeah and I just lost a Meowth when my phone crashed.” He then told me that I needed to wait for the little white ball to stop spinning before I threw the Pokeball. That little tip helped out a bunch it kept my phone from crashing as much. I became aware of the timing. It wasn’t perfect but it helped. One night I was riding with my neighbor and my phone suddenly showed a Pikachu on my nearby list. I asked my buddy if he could help me track him down. To our surprise we were able to track him down. His phone was much more suited to the task of Pokemon Go and he treated mine the same way. He had suggested that I turn off AR mode to save ram but he still had no idea how weak my phone was. He tried photographing Pikachu before we caught him and to our great frustration the app crashed and we were left with bitter disappointment. Over the weeks the App was improved and I learned to maximize my phones potential. Soon enough Pidgeys and Rattatas became blase. I was focused on become efficient. I learned to avoid Gyms because they would crash my phone. I would avoid evolving my pokemon so my phone would not crash while I was walking about. That way I could maximize my battery use and not have to wait an eternity to get on to the servers. I would get up early to avoid server strain while visiting areas with tons of Pokestops. I knew approximately how far I could travel before my phone would run out of charge. I would watch videos on how to get the most out of Lucky eggs or where to find the rarest spawns. Some days I would walk 10k just so I could hatch another egg that might level me up. Now the app is more stable. Now I can login almost immediately after logging out. The days of waiting endlessly are over. The game I’m sure will continue to have it’s quirks, and I’m sure that it will eventually fade as a priority. I’m not even sure if I want to capture all the Gen 2 Pokemon that are sure to follow. As of now I’m still excited about this game and will continue to peruse my quest to be the best. On a side note last night I had my best catch yet. I was walking with my neighbor and out of nowhere a wild Charmeleon popped up. Our excitement level shot up through the roof. We were able to catch him with relative easy. I was leaping with joy and blown away by how excited and happy I was to capture this illusive Pokemon. We continued to walk and the excitement was palatable. As a guy who once said “I don’t know if I could get into a game like that” I had come full circle.